Bumpers was a little-known lawyer from Charleston when he ran for the Democratic gubernatorial nomination in 1970, against a field that included former Gov. Orval Faubus. After finishing second in the primary, Bumpers defeated Faubus for the Democratic nomination – then beat Republican incumbent Gov. Winthrop Rockefeller in the general election. Bumpers’ signature moment on the national stage came in 1999, just weeks after leaving the Senate, when he defended Clinton – who had worked for Fulbright’s 1974 campaign against Bumpers – before the U.S. Senate during his impeachment trial. 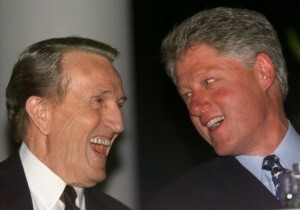 Left: President Clinton and former Sen. Dale Bumpers laugh as they watch a video about the life of Bumpers in Little Rock, late March 13. The event was a tribute to the retiring Arkansas senator who served in the U.S. Senate for 24 years and a "thank you" from Clinton for Bumpers' support during the impeachment process. Photo by Reuters.